I'm often surprised that some lessons are very popular with visitors to my site while other ideas that I thought might resonate with a wide audience have a lot less people viewing them. Perhaps "good" art lessons and ideas are just like "good art" in general - very subjective. That's fine though, art wouldn't be what it is without this innate characteristic. Anyway enough rambling... I was a bit surprised to see 10min Value Landscapes very quickly become my all time most popular post. I hindsight it may have something to do with teachers wanting to avoid messy painting clean-ups! 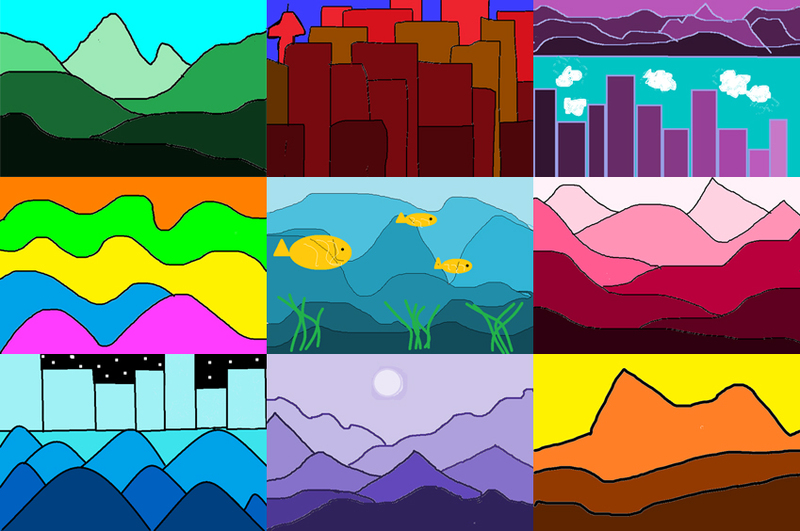 Here are a small selection of "value-scapes" a year 6 class created in computer class earlier in the year. They viewed the aforementioned post and I asked if they could see a way to extend the initial idea or put a new twist on it. In a break from tradition I've just posted a few that stood out for me. I know how you feel - my most popular post and pin was a cute but shallow (not much curriculum content or personal vision) holiday craft that I did on a whim with a group of students I was kind of babysitting - not a regular art class. Sigh. Luckily the post also showed some 5th grade painting techniques, but that's not what brought people there.